I have had a passion for working with children all my life. My experience includes babysitting children of all ages for 7 years, volunteering for Pathways for Children (Gloucester, MA) in their school aged program for 3 years, and working as a Junior camp (4-7 year old) YMCA staff member for one year. 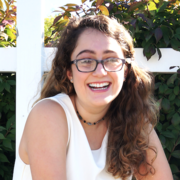 I am CPR certified, Psychology major at Scripps college hoping to become a Social Worker for children and families.